“On the wall, a school of mullet swims toward the Carolina coast, the silhouette of barrier islands and the undulating line of mainland stark against the aqua sea. Where I’m standing would be just beyond the western edge of the map, at the newly-opened Locals Oyster Bar in Raleigh’s Transfer Co. Food Hall, which has slowly been rolling out new vendors. And I’m ready for seafood. Standing in line to order, I’m tempted by the classic fare flying out of the kitchen—shrimp po’boys, fish and chips, ceviche—but it’s the constant motion of the shuckers that has me mesmerized: Working in near-silence, they grab shell after shell: In less time than it’ll take to read this sentence, they’ll study one for for the briefest of moments, insert the tip of a shucking knife into the hinge, twist a wrist and drop a perfectly shucked oyster onto a bed of pebbled ice. 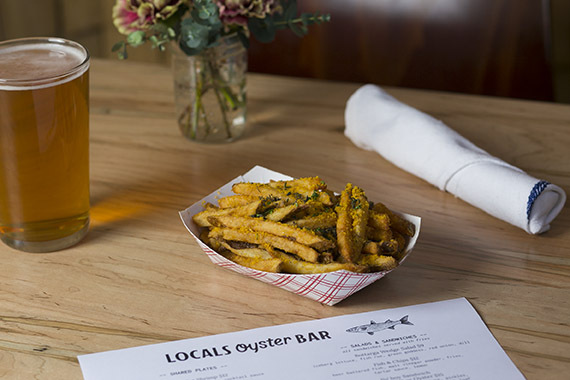 Locals Oyster Bar is the first foray into restaurants from the lauded fish wholesaler Locals Seafood, which will continue that part of its business as usual, including selling its oysters to some of the area’s finest restaurants and keeping up its fish market locations at farmers markets. The Locals Seafood team partnered with Person Street Bar to launch this new outpost with a full menu of wine, cocktails and local craft beer to go with that mouth-watering slate of seafood, plus a fish counter with whole fish, primal cuts and prepared food. Read the entire article in Walter Magazine here.